Explore all of the exciting and fun things to do and see in the Lompoc Valley. Click the information icon on a location or activity to learn more! 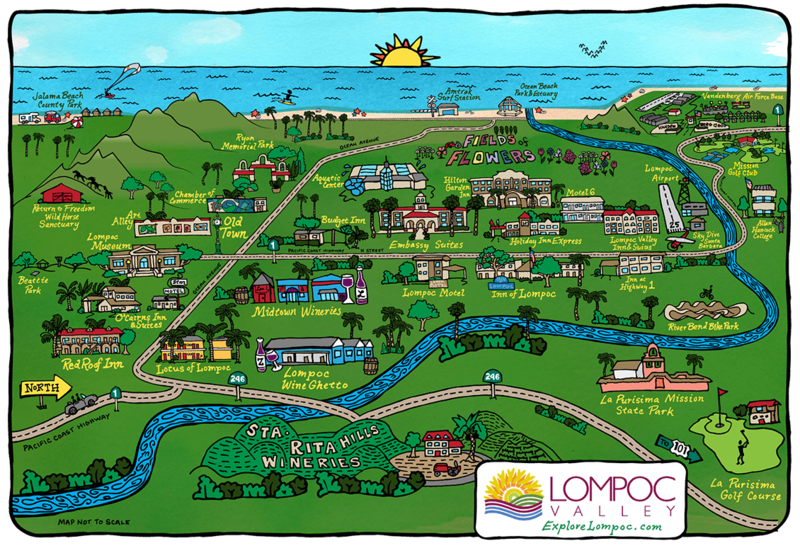 Explore all of the exciting and fun things to do and see in the Lompoc Valley. The Lompoc Wine Ghetto is a unique collection of more than 20 boutique wineries, tasting rooms, and production facilities in industrial park setting, all within easy walking distance to each other. The Inn of Lompoc offers very spacious and inviting guest rooms with free WiFi, microwave and mini-fridge. On-site amenities include free breakfast, heated indoor pool, spa, fitness center, guest laundry, and a complimentary evening reception Monday thru Saturday. Return to Freedom is dedicated to preserving the freedom, diversity, and habitat of America’s wild horses and burros through sanctuary, education, advocacy and conservation, while enriching the human spirit through direct experience with the natural world. Red Roof Inn is a modern, full-service hotel with 55 two-room hotel suites. Free Wi-Fi Internet and data ports, in-room complimentary coffee, 24 hour front desk service and more. Beattie Park features a disc golf course and horseshoe pits, a large group picnic area, children’s playground, two lighted basketball courts, a multipurpose soccer/football field, individual picnic areas, an urban forest preserve which has a popular winding fitness trail, and “Lookout Point” located at the highest point in the park. Immerse yourself in local history at the Lompoc Museum, featuring exhibits of Chumash Indians, a recreation of old Lompoc storefronts, and the pioneer history of Lompoc Valley. Housed in a former Carnegie Library building (built in 1910), the Museum also features art, photography, and traveling exhibits. O'Cairns Inn & Suites offers a wide array of amenities at reasonable rates, including a delicious continental breakfast each morning and complimentary drinks during Happy Hour, Monday - Friday. Rooms are spacious and include large flat screen TVs, and pillow top mattresses; some even have leather recliners. Remote Jalama Beach Park is a scenic, 30 minute drive from the city of Lompoc. It is a popular spot for camping, fishing, surfing, birdwatching, and beach strolls. The on-site grill is knowns for its amazing Jalama Burgers. Lompoc is known for its big art with more than 40 murals throughout town. A great place to start your walking tour of the Lompoc Murals is in Art Alley, located across from the Lompoc Valley Chamber of Commerce & Visitors Center. The Lotus of Lompoc offers free continental breakfast, a heated outdoor pool, and free Wi-Fi. Amenities also include guest laundry facilities, in-room microwaves, refrigerators, 32-inch LCD TVs, and comfortable new bedding. In Midtown Lompoc, just a few blocks from the Wine Ghetto, you’ll find two highly acclaimed Lompoc wineries - Longoria Winery and Brewer-Clifton - as well as the Lompoc Wine Factory, a community-based wine production facility for local winemakers. The Budget Inn of Lompoc guest room amenities include refrigerators, microwaves, cable TV programming, coffee makers, iron/ironing board, and complimentary wireless Internet access. Star Motel is a great local motel for the budget conscious traveler. The Ryon Memorial Park is a 22.5 acre community park that serves the entire Lompoc Valley and hosts a variety of community celebrations throughout the year including SpringFest, Flower Festival, Lompoc Valley Kennel Club Dog Show and many other special events. The Lompoc Aquatic Center is a state-of-the-art aquatics facility operated by the City of Lompoc. It is available for resident and visitor use, swim competitions, swim team training sessions, water polo tournaments, and private rentals. It’s one of the largest indoor water parks in California! From April through September and sometimes longer – you’ll see spectacular patches of colors as you drive near the farm fields of Lompoc Valley – Stock, Larkspur, Delphinium, Sweet Pea and Bells of Irelandalong with other cut flower varieties are grown in abundance by local growers such as Ocean View Flowers. Newly renovated, the spacious two-room suites at the Embassy Suites by Hilton Lompoc offer everything you need to feel right at home. Begin each day with a complimentary cooked-to-order breakfast then relax with complimentary beverages at the nightly Evening Reception in the Garden Room. Refresh with a swim in the outdoor pool or work-out in the 24-hour fitness center. Lompoc Motel, centrally located in town, is the budget conscious traveler. In Lompoc’s historic Old Town you’ll find colorful murals, specialty shops, historic buildings, museums, an art gallery, and local eateries. Be sure to take a self-guided walking tour of the murals to get a taste of Lompoc’s history and heritage. Chamber of Commerce & Visitors Bureau. Pick up visitor brochures, maps, and tips on local things to see and do in Lompoc Valley. Open Monday thru Friday, 8 am to 5 pm. Lompoc’s newest hotel, the Hilton Garden Inn Lompoc, features a welcoming open-lobby concept, modern amenities, spacious guest rooms, a heated outdoor pool and spa, fitness center, and elegant meeting space for small to mid-size meetings and events. The on-site Valle Eatery & Bar features locally inspired cuisine and craft cocktails. Stay at the Holiday Inn Express and enjoy a heated, outdoor pool and whirlpool, fitness center, and a free, hot Express Start breakfast bar. Guest rooms are equipped with free high-speed Internet access, a work desk, microwave, and mini fridge. Extended cable package on a 32-inch TV, and Serta Perfect Sleeper bed for your comfort. Discover breathtaking vistas, welcoming wineries, and exceptional wines around every bend. The Sta. Rita Hills AVA is known for its outstanding Pinot Noir, Chardonnay, Syrah and other cool climate wines. Step Back in Time to the most extensively restored mission in California. La Purisima Mission State Park, founded in 1797, offers a fabulous opportunity to explore California’s heritage. In addition to the restored buildings, the nearly 2,000 acre park is home to 25 miles of trails for hiking and horseback riding, a Visitor Center and Exhibit Hall, and livestock. La Purisima is a superior 18-hole Championship course, design by world-renowned architect Robert Muir Graves. The course has attracted pro tournaments from the PGA, LPGA and Senior PGA circuits, yet players of all skill levels come to Lompoc to enjoy its natural beauty and to test their game. Motel 6 Lompoc offers budget friendly accommodations. On-site outdoor pool. Wi-Fi available for a small fee. The Lompoc Valley Inn & Suites guest rooms have refrigerators, microwaves, coffee makers, flat-screen televisions, irons and ironing boards. Studio suites offer kitchenette, wet bar and sofa sleeper. Free hot breakfast featuring eggs, meat, yogurt, fresh fruit, cereal, and hot waffles. In Lompoc, you can take the highest tandem jump on the west coast! With Skydive Santa Barbara, take in unforgettable views of the Pacific ocean, hillsides, and vineyards, and feel the adrenaline rush of this once-in-a-lifetime experience. Allan Hancock College provides quality educational opportunities that enhance student learning and the creative, intellectual, cultural, and economic vitality of our diverse community. The Allan Hancock College Public Safety Training Complex boasts a state-of-the-art facility and serves as a premier training location for Fire, Law Enforcement, EMS, and Environmental Technology. With stately oaks and mature pine trees framing the fairways leading to undulating and terraced greens, the Mission Club features a golf course you’ll love to play. Designed by Ted Robinson, it takes full advantage of its spectacular natural setting. Vandenberg Air Force Base is one of the nation’s most important military and space installations, where unmanned test missiles and satellites are launched throughout the year. Blending contemporary design with desirable function, rooms at the Inn at Highway 1 feature plush bedding, contemporary decor, eco-friendly bath amenities, complimentary Wi-Fi, and in-room coffee makers with a complimentary selection of gourmet coffees. Wind-swept Ocean Beach Park & Estuary is where the Santa Ynez River meets the Pacific blue. At this pristine location you’ll discover Lompoc’s most engaging and beautiful shoreline. Bird-watchers and nature photographers flock to this destination, where all kinds of migratory sea birds can be seen. Amtrak Surf Station near Lompoc is a regular stop on Amtrak’s Pacific Surf liner, which travels between San Luis Obispo and San Diego, along the California coast. The Surf Station is an unstaffed rail stop, 10 miles west of the city of Lompoc. There is no bus service between the Surf depot and Lompoc; taxi cab service may be arranged.